This is one of my favourite weekend breakfasts and perfect to take back to bed with coffee, the question is who pops out to buy the papers whilst the chef is at work? 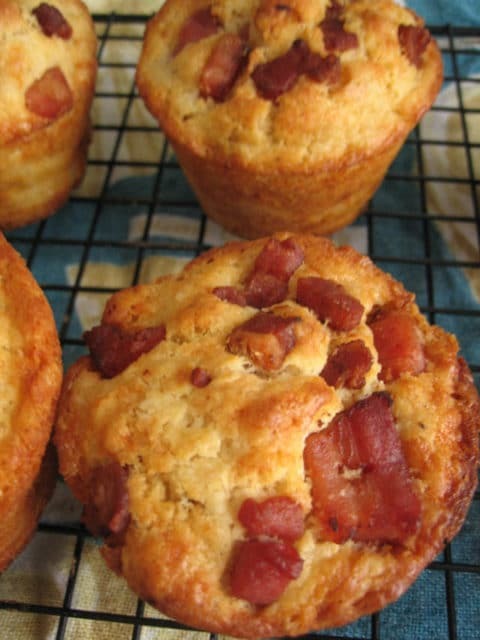 If you don’t like cheese you may enjoy my maple bacon muffins for breakfast instead? Or a sweet vegan peanut butter muffin. If you try this Cheese and Pancetta Breakfast Muffins please tag #FussFreeFlavours on Instagram or Twitter. It is amazing for me when for me when you make one of my recipes and I really do love to see them. You can also share it on my Facebook page. Please pin this recipe to Pinterest too! Thanks for reading Fuss Free Flavours! 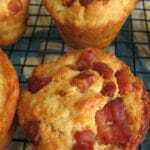 Cheese and pancetta breakfast muffins - quick and easy, ideal for a leisurely weekend breakfast. Heat the oven to GM5/190C/375F. Line a muffin pan with paper cases, or prepare a silicone mould. Mix the wet ingredients - the oil and milk. Mix the flour, baking powder and salt. Add the liquid to the flour, and fold together a couple of times. Don't fully mix the ingredients. Fold in the pancetta and cheese reserving some of the pancetta for sprinking on the batter. Cook until golden brown and when the tops spring back when pressed lightly - about 25 minutes. Variations Add some sun dried tomatos either as an extra or in place of the pancetta.